What’s a Cold-Water Sandwich and How Do You Prevent It? Home Uncategorized What’s a Cold-Water Sandwich and How Do You Prevent It? Noritz Service Technician Lead Desiree Lovelady addresses questions about the small, but annoying cold-water sandwich phenomenon in tankless water heater technology. When turning on the shower or a faucet in a home equipped with a tankless water heater, homeowners should quickly enjoy the sensation of the hot, flowing water. However, after a few moments, they might be suddenly struck with a short blast of cold water. This is commonly referred to as “the cold-water sandwich,” a sensation in which cold water briefly flows through a pipe without being heated. Despite its brevity, the cold-water sandwich can bring about at least slight discomfort for many. Desiree Lovelady, Service Technician Lead at Noritz, recently sat down with us to discuss this type of event and how homeowners can prevent those brief, but irritating encounters with a cold-water sandwich. Question (Q): Can you define what a cold-water sandwich is? Desiree: The cold-water sandwich refers to an event when water from a heater is warm for the first few minutes, followed by a burst of cold water, and then the water returns to its comfortable, set-point temperature again. Q: How can a cold-water sandwich happen? Desiree: Cold water sandwiches happen due to pressure-related reasons. When you turn hot water off, a tankless heater immediately stops heating the water. Even if it is just for a few seconds, there will still be a small period where you will experience that small burst of cold water. You can also see this happen with hot-water recirculation systems. Because warm water remains in the recirculation line after turning off a faucet or shower, no new water is immediately heated, providing cold water for a short period. Q: Is this more common with tankless water heaters or storage tank heaters? Desiree: This is more common with tankless water heaters. While this issue can happen if a storage tank runs low on hot water, it is pretty rare. 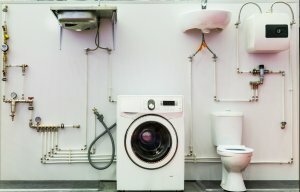 Tankless water heaters run on demand. After you stop using hot water, a tankless water heater will not warm up water right away. Storage tanks do not activate on demand but maintain a water supply that is already heated and ready for use. Q: How substantial is this problem for the industry? Desiree: The cold-water sandwich is a common issue for many manufacturers of tankless technology. It can be hard to say how much it affects other heaters, since it depends on the application. However, this phenomenon lasts for only a couple of seconds, so it is never anything substantial — like having no hot water for several minutes. However, it is an understandably annoying issue. Q: How can Noritz combat the issue? Desiree: The best way to handle this issue is by having a five-gallon Buffer tank for your tankless water heater. Since it stores some hot water, it can prevent individuals from feeling that cold burst of unheated water. Anything bigger than five gallons — well, that might be pushing it a bit. These tanks normally cost around $100, so it is not extremely costly to homeowners. While the cold-water sandwich can be annoying, its occurrence does not negatively impact a tankless water heater’s ability to provide warm water for homeowners.